A treat for my first Turkish vegetarian meal outside of Istanbul, in the quaint Ottoman town of Safranbolu. Peruhi: Vegetarian Turkish pasta, stuffed with a bit of cheese and mint, and cooked with yoghurt, milk and olive oil. Ayran: A traditional yoghurt drink in Turkey. Similar to the Indian chaach, and served with almost any kind of food in Turkey. Homemade dessert made from yoghurt, with a tinge of spice (can’t find the name among my notes, sigh). The owner at the cafe made this for a family celebration later that evening, and offered it after hearing that I had come all the way from Hindistan! In the small seaside town of Cide, vegetarian “home food” at a lokanta, which refers to a small eatery in Turkish. Fasuliye: Whole Peas and legumes cooked together, served with rice and Ayran. In Amasra, a seaside town popular with Turkish holidayers, the famous Turkish (vegetarian) pide! Vegetarian delights at rest stops on bus journeys. Gozleme Patate: The closest I could get to a steaming hot aloo parantha in Turkey! Gozlemes are the most commonly available food at rest stops made by public buses plying from one town to another. They are typically stuffed with peynir, which is Turkey’s version of cheese; to me, peynir tasted like raw paneer and seemed unpalatable after the first try! If not available with patate (potato), I preferred a plain gozleme, which when made fresh, tastes savory and delicious. Vegetarian treats at cafes without menus, especially on northern countryside. Nohut / Kuru fasuliye: Chickpeas / kidney beans (typically canned) served with rice. Forgive my Indian taste buds to be reminded of rajma-chawal and chhole-chawal! It is important to specify that you want this minus the meat, since the Turkish people like to garnish all their food with meat out of habit. Cacik: (pronounced jejik), yoghurt churned with cucumber and mint, somewhat like the Indian raita. Turkish delights: Too sweet even for my sweet tooth, but loved their colorful displays throughout Turkey. The tastiest hazelnut chocolates I’ve ever had, in the hazelnut chocolate factory in Ordu. The northern region is the hazelnut belt of the country. 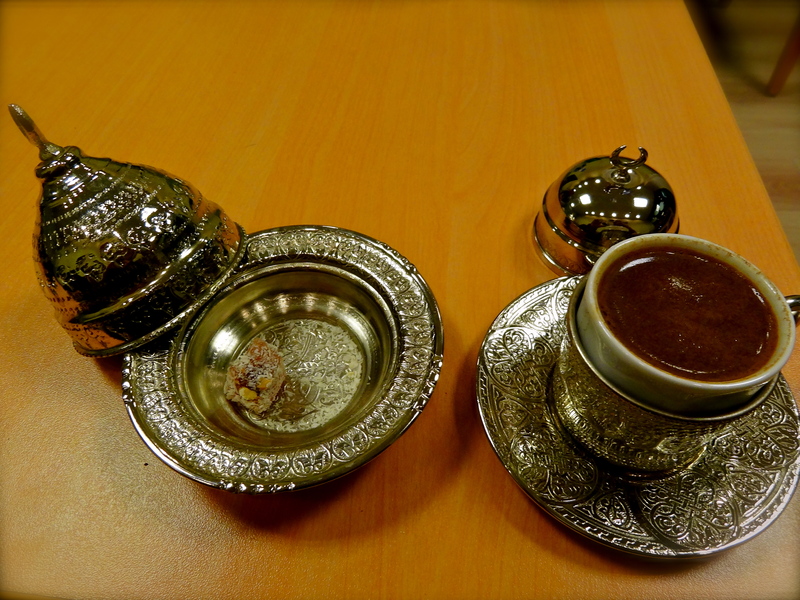 Special Turkish coffee, made by newfound friends in my favorite Turkish town, Ordu. Menemen: Turkey’s version of scrambled eggs. Aubergine, in all forms and shapes, common in Cappadocia and the south. Simit: Sesame-coated bagels served in carts on the streets of Istanbul. Borek: Savory Turkish quiche typically stuffed with cheese and spinach. What Turkish vegetarian dishes would you most like to try? Join The Shooting Star on Facebook and Twitter for more travel stories from the road. Your quality of pictures is such that these dishes are looking delicious even without tasting them. A post which needs to be bookmarked by all vegetarians like us before proceeding to Turkey. Btw what is Ayran ? Thanks Manish, I really appreciate the compliment to my pictures, especially coming from you! Ayran is something like the Indian chaach or buttermilk, yoghurt churned with a salty taste. Beautiful pictures.. I am going to Turkey in April, hope the food is spicy enough for my indian taste buds. I’m quite relieved on reading your blog, I was expecting to eat only kebabs and burgers for 2 weeks of my travel. I came your blog while looking up what others are writing about vegetarian food in turkey. Love your blog, pictures and writing!!! Proud that an indian person has done and seen so much. I think that you epitomize all that we would like to be in many ways. The sense of adventure, entrepreneurship, self-confidence and …. having fun doing what you love. You would be happy to read that you have made me free from tension about veg food in Turkey. As I read that non-veg is commonly preferred in Turkey and it is too hard to get any veg food court. But now I am feeling so relaxed after reading your article. I have planned a Turkey trip itinerary to explore some of the tourist attractions in Turkey. As I am a completely vegetarian so now I am confident about my food during the trip. I just love your informative content and mouthwatering images. Thanks for the post. Previous PostWhy The World Should End on December 21st, 2012. Next PostMy Travel Bucket List for 2013!